Philadelphia Eagles quarterback Carson Wentz during organized team activities at NovaCare Complex. That Carson Wentz is the most important player to the Philadelphia Eagles is a sentiment almost no one would argue against — even after his backup, Nick Foles, won Super Bowl MVP while leading the Birds to their first Lombardi trophy in franchise history. And now, not only will the third-year quarterback who tore his ACL in a December win over the Rams will have to deal with more than just his rehab and return from injury, he'll also have to adjust to life under a new offensive coordinator, former wideouts coach Mike Groh. Which Eagles players could still be traded before season? A change in offensive coordinators can be a big obstacle for young quarterbacks, especially when you consider that this will be Wentz's third in the last four years. And, even though the argument is dumb and completely off-base, it already has some in the media concerned about what it means moving forward for the reigning champs and their franchise QB. Just ask Colin Cowherd. “By the way, you’ve already lost your offensive coordinator, Philadelphia," he said during a typically-misinformed monologue recently. "Go ask Atlanta and Matt Ryan what’s that like. They went to a Super Bowl too, should have won it. Lost their offensive coordinator, not the same team." In case you missed it, our own Jimmy Kempski tracked down the Falcons quarterback* to find out just how much trouble the Eagles are in this season. Here's a snippet from his story last week applauding** Cowherd for his thought-provoking rant. Jimmy: [...] What can the Eagles expect now that they’ve lost their offensive coordinator like you did last year? Matt [Ryan]: Well, you cover the Eagles, right? So you’re aware that it’s Doug Pederson’s offense, right? In Atlanta, our head coach is a defensive-minded guy in Dan Quinn. When the OC left and we hired a new one, the entire offense changed. You do see the distinction there, right? You’re terrible at your job, Jimmy. *Jimmy did not actually talk to Matt Ryan. **By applauding, we mean mocking. I won't weigh in on Ryan's last point there about how good Jimmy is (or isn't) at his job, but it's hard to argue with the part about it being Doug Pederson's offense. That was the case in Years 1 and 2, so there's no reason to expect it'll change just because Frank Reich left after being hired to coach the Colts. And on Tuesday, during his first press conference of OTAs, Groh confirmed as much. So what will Groh's main job be this season as an offensive coordinator who doesn't call the plays – remember that was Pederson's job, except when it came to calling the Philly Special, which, of course, was Foles' job? "To help support Coach [Pederson] in the same way that Frank [Reich] did," Groh said, adding that he'll likely remain on the sidelines during the game as opposed to in the booth. "If we can do that, Coach will call a great game, but he needs support from the guys in the hallway upstairs." Groh, who spent time with the Bears and Rams before joining the Eagles last offseason, also believes that having a year in Pederson's system — as opposed to coming in fresh from the outside — will be key to making it a smooth transition, not just because he's familiar with how the Birds operate, but also because he's been able to learn from his bosses. "I feel like I have to be a product of the people that I've been around," he said. "Obviously, I learned a significant amount from Coach Reich — I was able to watch how he and Doug worked together, and hopefully I was observing the right things." "It's an advantage being here, and being through the season here, and seeing how our process works," added Groh. "Every team is a little bit different, so being able to see and be involed with that is very beneficial." It's also helped head coach and coordinator develop a relationship, rather than trying to build one on the fly. And, it seems, that's helped the first-year coordinator adjust to life in his new role — and help those around him adjust to him being in said role. "I think it's excellent," Groh said of his relationship with Pederson. "It's certainly evolved since I got here, since we didn't have any history together. It's been fantastic since we got together this spring. ... The transition has been smooth." 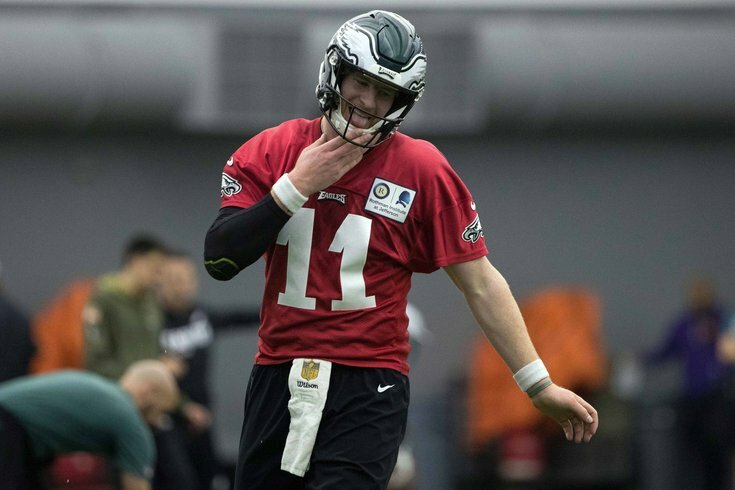 As for what that means for Wentz beyond the obvious, it also certainly also helps that his new coordinator — much like his old coordinator and his head coach — is a former quarterback. And even though he's spent the last half decade coaching his passing-game counterparts (wide receivers), Groh is still a QB at heart. "I see the game as a quarterback, by trade," Groh said. "I have coached wide receivers in the NFL for the last six years, so I guess that's where my expertise is at this level, but I have always seen the game through the eyes of the QB."